Just over two years ago, this column wrote about how a series of late driver substitutions threw the Pick 5 sequence into chaos on one snowy January night at the Meadowlands. One of the most amplified points in that column had to do with a driver change in one of the races from top catch driver Brett Miller to journeyman trainer and driver Bill Mann. Let’s say that in his response posted to the column on the Harness Racing Update group on Facebook, Mann didn’t take too kindly to my words. With each Mann win since that time – especially at the Meadowlands in races where he beats me – there’s a certain irony that doesn’t escape me. But it was his drive from this past Friday night at the Meadowlands that has prompted a follow-up. In the night’s 7th race, Mann drove Narican Jewel – a mare that he also trains. 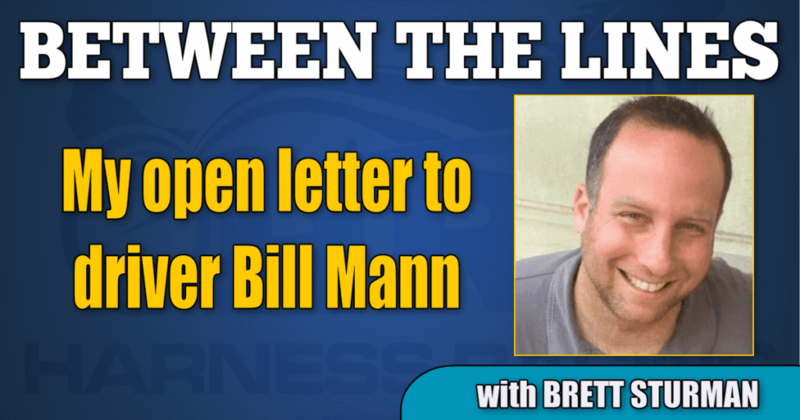 Dismissed at 7-1, Mann came first-over from fifth prior to the half mile and had the unenviable task of doing so against a heavily backed 1-2 favorite. Mann got Narcian Jewel into a challenging spot about a length away from the leader around the final turn and into the stretch, but that seemed to be about it. Throughout almost the entire length of the stretch it still didn’t look like Narican Jewel was going to ever get there, but Mann somehow kept his mare alive. Not only did track announcer Ken Warkentin proclaim that Narican Jewel was now “faltering” after the tough trip, but other fresh challengers were emerging both to her inside and outside. Somehow Narican Jewel was able to sustain and find more as the wire came and she got up for the win by a nose in a blanket finish. The win was a credit to Mann in being able to keep his mare going. It was so good in fact that my father texted me immediately after the race and said how that drive was reminiscent of Herve Filion, in the way that Herve used to be able to keep a horse alive. Filion and Mann in the same sentence; you can’t get any better than that. This win wasn’t the first time Mann has been able to show a knack for winning with horses first-over. He’s shown it many times over the past couple years, including countless wins coming in that style at half-mile tracks where it’s even more difficult to keep horses out longer around more turns. But in addition, Mann has shown an ability to consistently put horses in positions to win. As someone who largely drives his own stock, he doesn’t always get the power that other drivers get yet still gives horses chances to win if they are good enough. Over the past two years, Mann has driven admirably. A look at the numbers may not show it as UDRS’s of 0.162 and 0.175 aren’t exactly anything to write home about, but the numbers don’t tell the complete story. Mann does the best with what he has to work with, and his 52 wins last year as a driver were his highest since returning to racing following a brief hiatus a few years back. Twelve of those wins came at the Meadowlands, two of which included bringing home 30-1 longshots on back-to-back nights last January. The win Friday was Mann’s first of the Meadowlands in 2019 through 10 prior starts, though he won at M1 four times last month in December. Of those wins, the most visually memorable one was from Dec. 13 and again with Narcian Jewel – a horse that along with Mann clearly has a flair for the dramatics. In that race, Narcian Jewel gunned from post 8 to make the lead before yielding to the favorite and eventually was third through a :54 and change half. From there, Mann waited patiently as you see him assessing the situation in front of him into the stretch and was then able to sprint up the inside late in a race where it looked like he had no business winning with an eighth of a mile to go. The examples could go on from there. Seldom does Mann have the best horse of the race on paper, so often times he has to (and does) give ideal drives on horses in order to get wins. He did it in another one of his wins last month at the Meadowlands with Our Els Dream N, where every inch of that drive was needed for the razor thin win. Mann may never be the highest-level catch driver, but he’s certainly proven himself to be capable. I still would maintain that in the situation from two years ago that a Brett Miller type should never be replaced with a 2-for-32 journeyman type (after bets have already been placed), but Mann is better than what I first gave credit for. More importantly, he’s a driver that even when at the Meadowlands today, you can place a bet on him and feel good about it knowing that more often than not you’re going to get an honest try. His races over the past couple of seasons show that and because he’s still not a household name, his drives typically have value to offer. So, to Bill Man I say this: Coming from a once-called “columnist not qualified to write a Dear Abby column let alone voice my opinion on a sport I know nothing about,” please consider this my formal apology. I am happy to have been proven wrong.